Whether you’re a hobbyist or a professional baker, the right airbrush can take your cake decorating skills to the next level. Most airbrushes designed for cake decorating are single-action; this means that one user action controls the color distribution and the airflow. When the user depresses the airbrush gun’s trigger, a stream of air and color is released. With many models, the intensity of the color is determined by how hard the user depresses the trigger, while the airflow always stays the same. With double-action airbrush guns, users perform two separate operations to control the two variables. So you have to simultaneously pull and press the trigger to achieve your desired air pressure and color intensity. While this can give bakers greater control over their decorating, it can also be difficult to manage. Nonetheless, some bakers prefer the precision offered by double-action guns. Every airbrush system is equipped with a feed system, which controls how the color enters and exits the airbrush gun. Cake decorating airbrushes often use gravity-feed mechanisms; they rely on gravity to feed the color into the gun, which minimizes the need for air pressure. Because the airbrush system doesn’t have to waste air pressure on funneling the color from entry to exit, they give bakers the control they need to achieve detailed results. Other airbrushes use siphon-feed mechanisms. The container of color is placed on the underside of the gun, and the system uses suction to draw the color into the gun and out of the nozzle. Siphon-feed air guns have one distinct benefit; they can hold greater quantities of color. This makes them useful for professional bakers working on large-scale baking projects. There are two basic components of any airbrush system: the gun and the compressor. The compressor generates the air pressure, which ensures a smooth, even distribution of color. For baking applications, finding the right compressor setting is key. Inadequate power will distribute the color unevenly, and too much power can dent the icing. If you’re concerned about compressor power, look for a system that come with knob that regulate pressure. For most of your cake decoration, you need 18-25 PSI pressure from compressor. 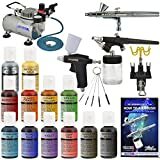 Here are top 5 airbrush kit for your cake decoration. 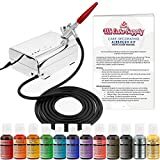 This Master Airbrush kit comes with the supplies bakers need to create decorated cake masterpieces. The dual-action airbrush can achieve a variety of decorative styles; thanks to the needle and nozzle construction, it can spray delicate lines of color or inch-wide embellishments. This airbrush is ideally calibrated for detail work, and the regulator feature ensures that the airflow is never too intense. It uses a gravity-feed cup to transfer color through the airbrush system, which enhances accuracy and cuts down on wasted product. 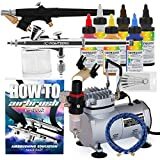 Bakers new to airbrushing will appreciate the included How To Airbrush Manual and Guide Booklet, and bakers who need space to decorate will be grateful for the 6-foot air hose. The kit also comes with 12 distinct colors, ranging from midnight black to metallic gold. The PointZero kit comes with two, professional-grade airbrushes. There’s the PZ-270 dual-action airbrush, which has an internal-mix design that helps users achieve precise patterns and details. The second options is the PZ-276 single-action airbrush, which is ideal for beginner bakers. With a simple press of the trigger, bakers can control the release of paint and air. These actions are all powered by the Elite-125X compressor, which combines exceptional air pressure with minimal noise. The system is designed to be intuitive. It’s easy to move between the two airbrushes, as the compressor is lightweight and offers easy connectivity. The set also comes with a starter pack of paints. With these six, 2-ounce pigments, bakers can achieve vibrant, even coverage on icings ranging from whipped cream to fondant. 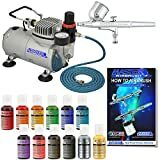 New airbrushers will also benefit from the bonus airbrush guides, which offer tips on maintenance, artistic skills, techniques, and lettering. For detailed, delicate work, you can’t go wrong with the Kopykake Airmaster Airbrush Set. It doesn’t come with a ton of extra features, but this streamlined set is great for the experienced airbrusher looking to refine their technique. An airbrush, a compressor, a wrench, and a hose are included with the set, but the quality of the equipment makes up for the lack of paints and bonus features. The set has an adjustable air pressure knob; with a simple turn of this knob, bakers can control the force of the air pressure. Lower pressure is great for thin, precise details, while higher pressure provides quicker coverage. The set also has an air accumulator tank, which helps to cut down on unwanted pulsations, which can ruin an intricate airbrush pattern. While this set may be too barebones for beginners, professionals will appreciate its adjustability features and overall quality. This kit is loaded with great supplies suitable for airbrushers of all skill levels. The single-action airbrush has a .4-mm fluid tip and a gravity feed, which assists with precision. The professional-grade compressor operates at 12V DC and has three airflow settings, ensuring that users have total control over air power. Beginner decorators can get started right away thanks to the 12 shades of food colors included in the set. Along with the essential equipment, the U.S. Cake Supply kit comes with a comprehensive user guide and food coloring chart. The supplementary guide includes useful information on blending colors, writing words, applying patterns, and decorating fondant. The tips and tricks are explained in simple terms, so that even kids can join in on the decorating fun! With three different airbrushes and one powerful compressor, this Master Airbrush set is perfect for professionals. The airbrush options each have distinct features. The G70 has a dual-action trigger, which gives users immediate control over air and fluid. 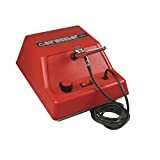 The G25 airbrush has an attached angled gravity cup, which ensures users can operate on horizontal surfaces. Also included is the E91 airbrush, a single-action gun with a siphon feed. All of these airbrushes pair with the state-of-the-art compressor. It has a variety of great features, including an automatic on/off shut-off and a water trap filter. This light, travel-ready compressor is perfect for bakers who decorate cakes at multiple venues. Also included in the set are 12 food colors, an airbrush holder, and an airbrush cleaning kit. It’s a great choice for bakers in need of a professional-grade kit that can handle every decorating challenge. After every use, clean your airbrush thoroughly with clean water. Pour water into the cup and run airbrush until all color is gone. You can also try Vodka instead of water.